The following is accurate as of the date of writing. While I do not expect that there will be any significant changes in the functionality of the website for this session of the lege, I cannot rule out the possibility that there will be changes – that’s completely out of my control. It was created while using Mozilla Firefox as the browser. Other browsers may display differently. No matter how well this is written, it will not and should not be expected to replace experience with using the website. I hope this helps people get started, but users should take the time to familiarize themselves with the website and its nuances *before* they need to use it efficiently. Lastly, this is not a comprehensive guide to using the website. I’m covering the basics in a way that I hope serves to help people who are just getting started. 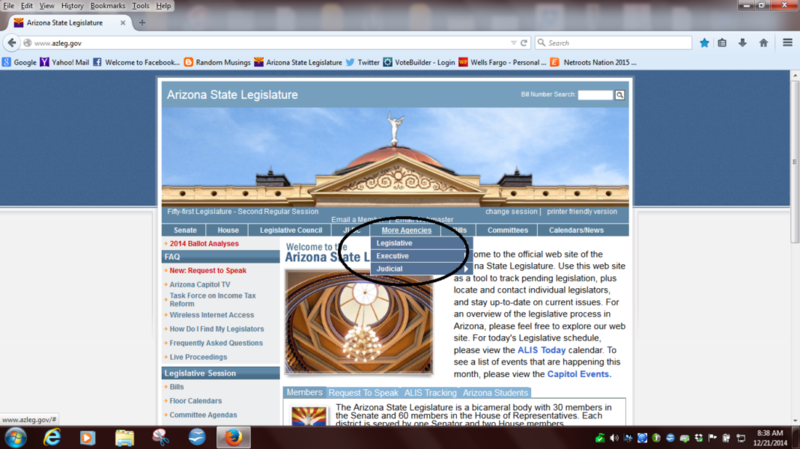 Point your browser at http://www.azleg.gov/. The last post was an overview of some of the options available on the legislature’s website, specifically options available on the “Senate” and “House” drop down menus. 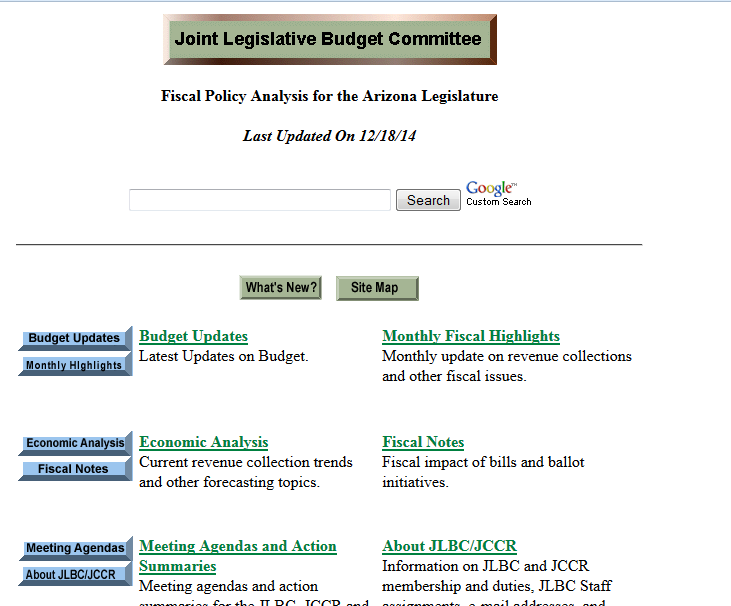 The next post in this series will cover using the “Bills” and “Committees” drop down menus. 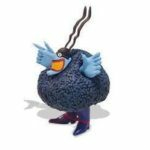 This post will attempt to highlight some of the other useful options available on the front page of the lege’s website. Many of the pages that are have links going down the left side of the main page are also linked in drop down menus across the top of the page. For the sake of brevity, I will focus on the drop down menus. 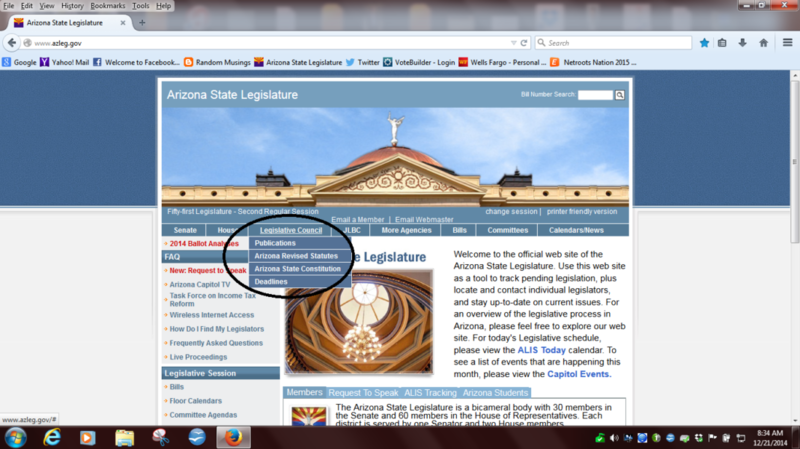 The links of primary interest here are to Arizona state law (aka – Arizona Revised Statutes, or “ARS”) and the Arizona State Constitution. This can be a *very* useful page for people. This page contains all sorts of links to all sorts of fiscal information relevant to the people of the state – elected officials, agency heads and policy planners, and Joe and Jane Schmoe alike. 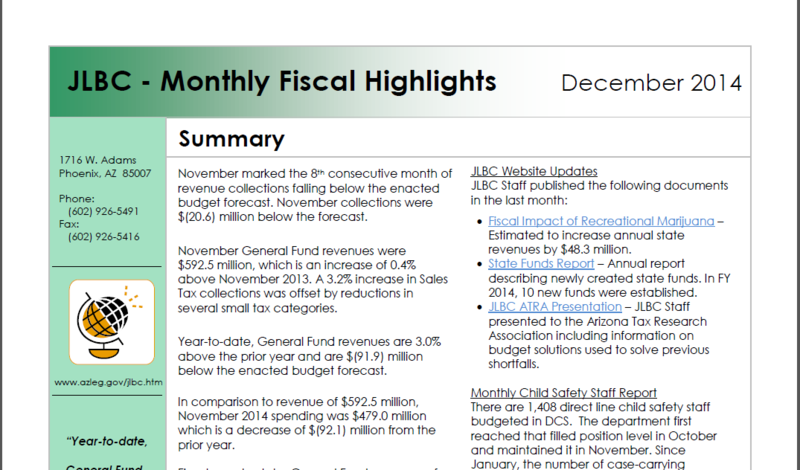 The highlight may be the monthly fiscal report (available as a .pdf file). While the juicy part of the report is the data on state revenue, expenditures, and economic forecasts, there are also reports from many state agencies (warning: it should not come as a shock that these reports have a fiscal bent to them 🙂 ). This one offers links to other state-level entities from the Legislative, Executive, and Judicial branches. 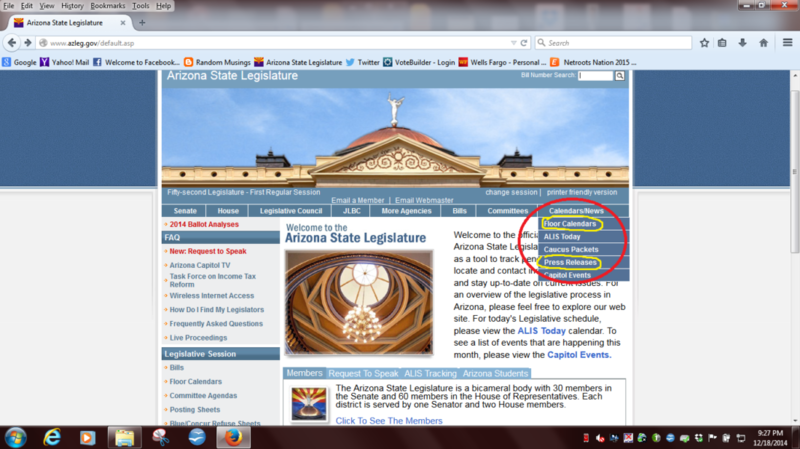 Useful, but not loaded with information about the legislature, which is the focus of this series of posts. This is an important drop down – it has a link to floor calendars, or listings of measures that will be up for floor consideration within a day or two of publication (usually not further ahead than that). 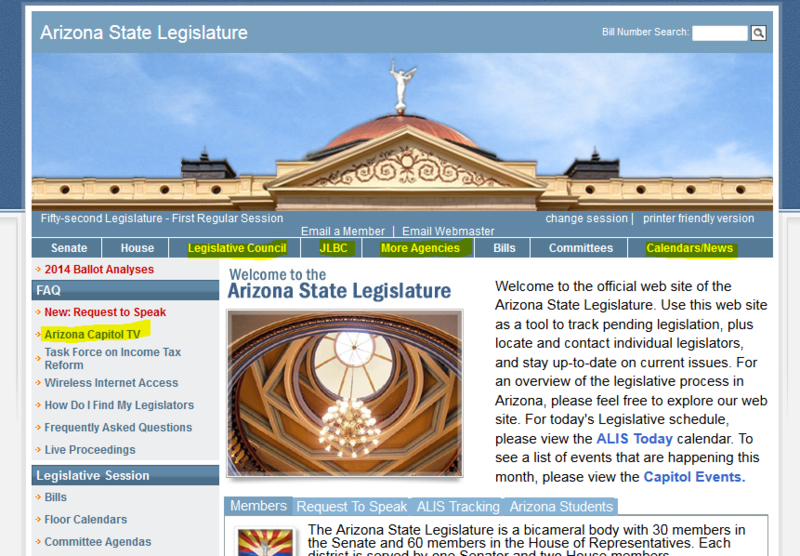 It also has links to legislative press releases and a calendar of events at and around the Capitol. The calendar lists events that have been registered with the operations staff of the Capitol. Demonstrations and protests will not be listed. 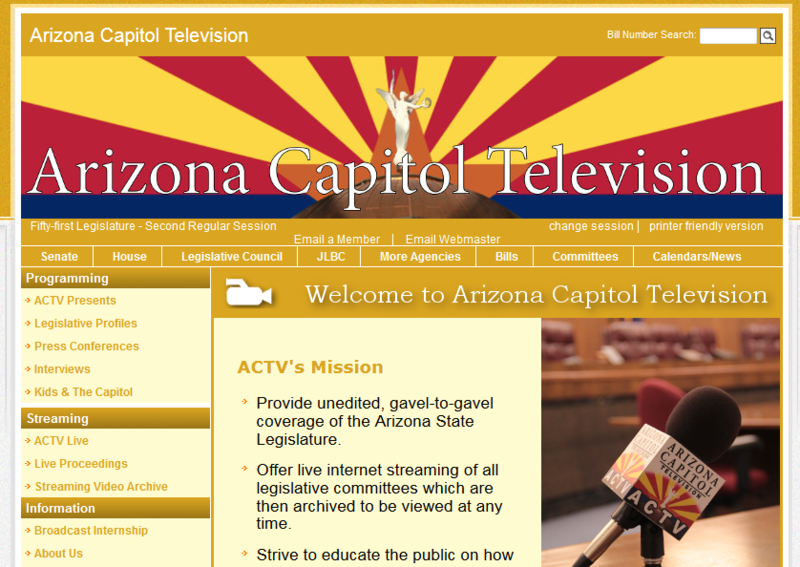 On the left side of the main page is a link for Arizona Capitol Television (not a perfect analogy, but it will do: AZ’s version of C-SPAN). Not known for incisive reporting (it *is* operated by the lege, after all), but the page does contain links to interviews with and profiles of many legislators. 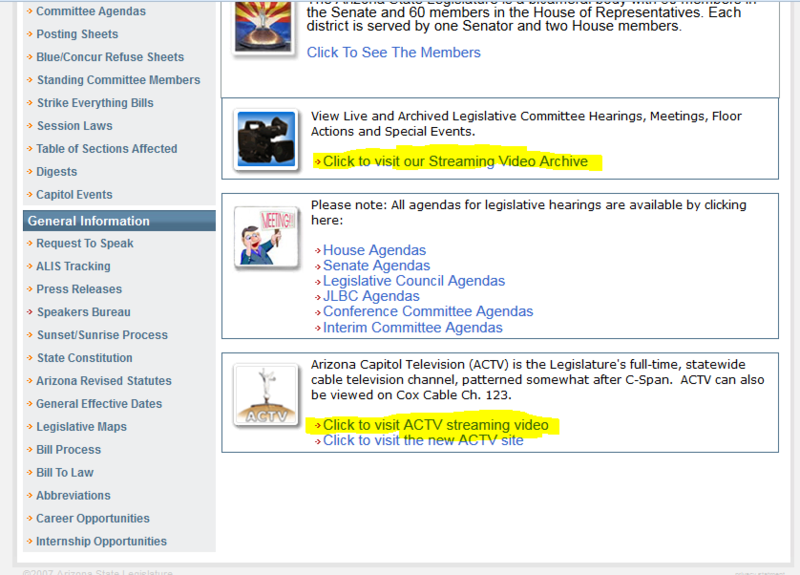 More useful (depending on the robustness of your internet connection 🙂 ) is the link in the approximate center of the page that goes to the lege’s streaming video archive. 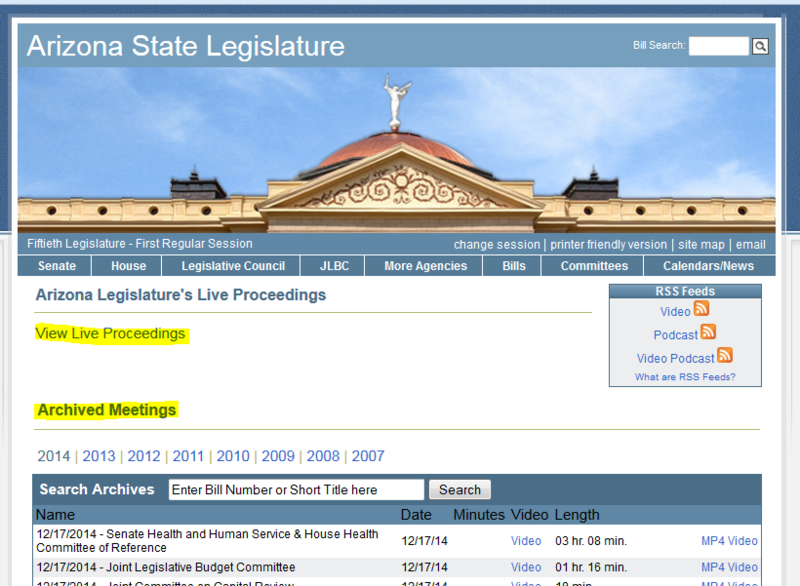 Video records of archived meetings – the lege doesn’t keep a written journal of what is said in floor or committee discussions, so this is the best available way of seeing what is actually said at the lege. Even better than that, particularly for people who can’t make it down to the Capitol is the link to the lege’s livestream feed. Once the video viewer is opened, users can see the activities in any of the lege’s meeting rooms or on the floor of either chamber. Graphics from Part 2 Section 1 have gone missing? The graphics are back. I had accidentally deleted them from our media “library”, but I reloaded them.